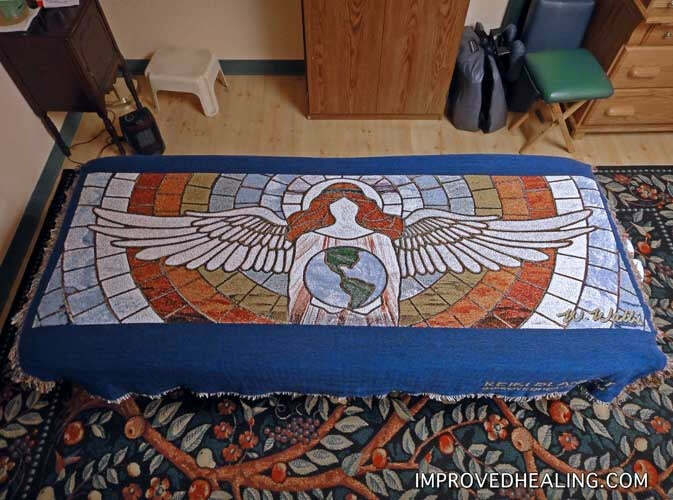 Recently, I was contacted by the gracious Mary Wallace of improvedhealing.com, offering to send me one of her absolutely gorgeous Energy Healing Blankets, and some healing jewelry they make to review and one for a giveaway (yes, you read that right!). I happily accepted. I received a package a short while later. The Healing Blanket is absolutely beautiful. It's healing energy-charged, and also embroidered. It has a gorgeous angel image design. And, as you can see, my cat, Pippy, loves it! Before I even opened it from its package, he was laying on it in the box. You can get one for yourself at the Improved Healing website here (and it has free shipping, too). 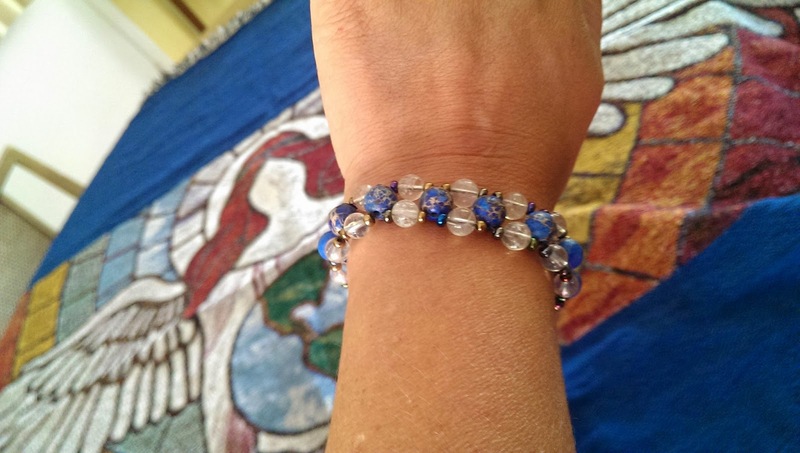 I also received two pieces of healing jewelry. This Uplifting Gaia bracelet has map jasper (shaped like Mother Earth - gorgeous), and citrine beads. I love it. It makes a great gift, and I'm happy to enjoy the good energy from mine, with much gratitude. You can view all of the loveliest healing jewelry I've seen yet, crafted with love by Mary Wallis, here on their ImprovedHealing.com website. This bracelet is a new item, soon to be listed on their site. If you want to get one and be "twinsies" with me, check back. Mary told me that she's making up more, and there should be a listing for it by the middle of next week. And now....yes! Mary and William Wallis gave me a fantastic, absolutely breathtaking necklace to GIVE AWAY to one of you wonderful readers! 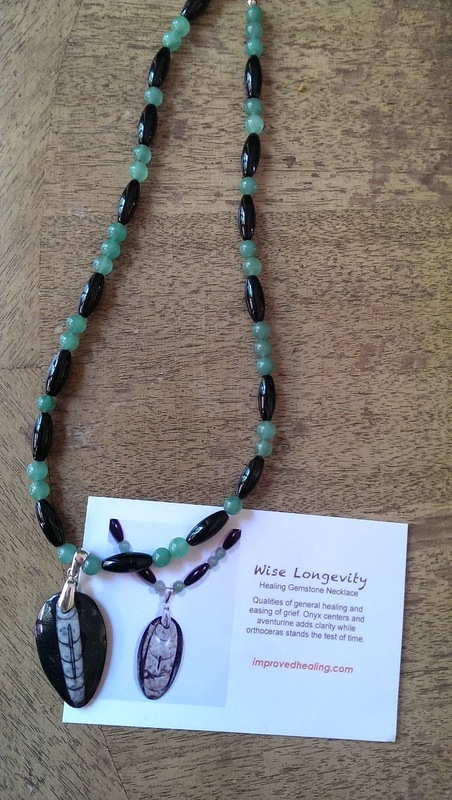 It's the Wise Longevity necklace, which features onyx and adventurine beads surrounding orthoceras with a beautiful design in the center. You can see it and read the description from their website here. I'm sure by now you're wanting to know how to enter to win this gorgeous necklace. 1) Visit the ImprovedHealing.com website, and leave a comment on this post about what products you like on their website. 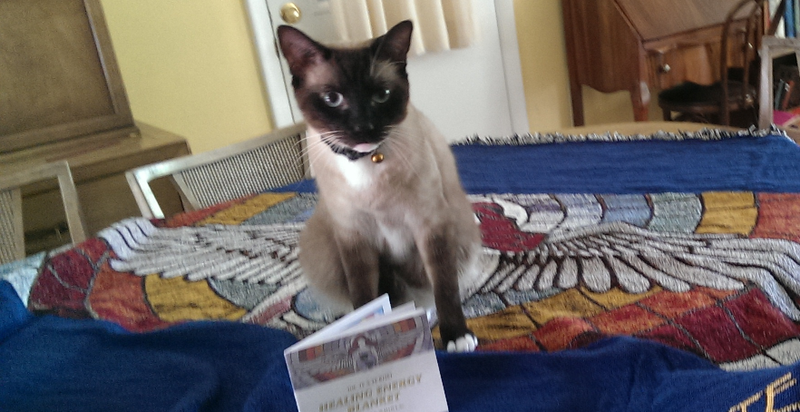 2) Like Healing Energy Blanket on Facebook and leave a comment that Alice from Reiki Awakening sent you. 3) Visit ReikiAwakeningAcademy.com, browse classes and/or the Store, then like Reiki Awakening Academy on Facebook, and leave a comment about a class or product that interests you. 5) Follow Reiki Awakening Academy on Pinterest, and leave this comment on any RAA pin: "I entered the Reiki Awakening contest to win a healing gemstone necklace!" On July 4, 2014 at noon Eastern time, I will put in an entry for you for each of the items above that you completed, then randomly pick one lucky winner! I'll email the winner and post the winner's name here as an addendum to this post that day! Happy entering! I'm sure you'll love all of the websites, Facebook and Pinterest pages I've sent you to, also! Note: my reviews are my own views, and I disclose that I received these products as a gift from ImprovedHealing.com in exchange for my review and this giveaway. Regardless, I gave an honest review of these items. Another note: If anyone else would like me to review their healing/holistic/metaphysically-inclined book or product, send me an email. I'm happy to consider it and get back to you promptly! Thank you to all who entered this contest/ giveaway! I'm glad you had a chance to view the heartfelt creations and beautiful energy of ImprovedHealing.com. Congratulations!! Ida, please send me your snail mail address so I can send you your beautiful prize! From time to time, I'll have another giveaway, so if you're not already, please subscribe to my blog (using the box at the top right of the page), so you don't miss a post! Love and light and a Happy Independence Day to all!